Conway Tubular Bridge from the Railway Architectural Series is shown below as a carriage print painted in water colour by Claude Buckle. The Conwy Railway Bridge carries the North Wales coast railway line across the River Conwy between Llandudno Junction and the town of Conwy. The wrought iron tubular bridge was built by Robert Stephenson to a design by William Fairbairn, and is similar in construction to Stephenson's other famous tubular bridge, the Britannia Bridge across the Menai Strait. Being the first tubular bridge to be built, the design needed much testing on prototypes to confirm that it would be capable of carrying heavy locomotives. 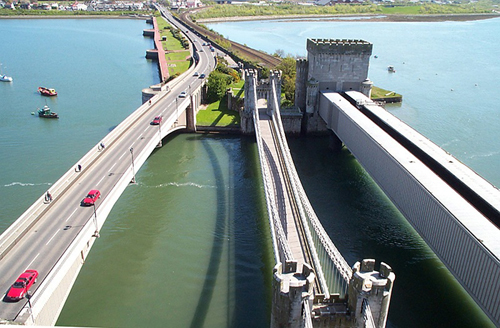 The successful result enabled the much larger Britannia bridge to be built. Since the destruction by fire of Britannia Bridge in 1970, Conwy railway bridge remains the only surviving example of this means of construction undertaken by Stephenson. The Conwy railway bridge runs parallel to an elegant suspension bridge built by Thomas Telford, which is now in the care of the National Trust. These crossings of the Conwy resemble in miniature the two greater crossings of the Menai Strait. Conway Castle shown on the left of the picture was a mighty stronghold of Edward 1st, with its huge battlements and eight tall drum towers, is one of the best preserved castles in the UK. Photograph showing the Conway Tubular Bridge and Telford's suspension bridge. The modern third bridge spanning the river Conway did not exist at the time.